I really need carbs in the morning. I'm pretty much an angry dragon until I get my carbs and an entire French press of coffee. No scrambled egg whites and plain Greek yogurt for me. When I went gluten-free, breakfast was by far the most difficult meal for me. I have yet to find a gf bread in the local grocery store that is worth paying $6 for. And Rice Chex is a great cereal option, but a girl can only eat so much Rice Chex. Gf oatmeal is another option, but I'm not a fan of hot, creamy oatmeal in the summer. Luckily for me, I made a batch of these muffins. I actually ended up making two batches because my kids and husband kept stealing them. Big, moist, full of bananas and chocolate chips, and with a crunchy walnut-chocolate chip topping...they are pretty much the perfect start to a morning, or even a pick-me-up snack in the afternoon. Preheat the oven to 350°. Prepare muffins pans with cupcake liners. In a large bowl, mash the bananas with a fork. Whisk in the sugar, oil, eggs, yogurt, and vanilla until smooth. In a separate bowl, whisk the flour, baking powder, baking soda, and salt together. Stir the dry ingredients into the wet ingredients until well blended. Fold in the chocolate chips. Fill the muffin wells 2/3 full. In a small bowl, prepare the topping by mixing the walnuts and mini chocolate chips together. Sprinkle the topping evenly over the top. Bake for 19-23 minutes, or until a toothpick inserted into the center comes out clean. 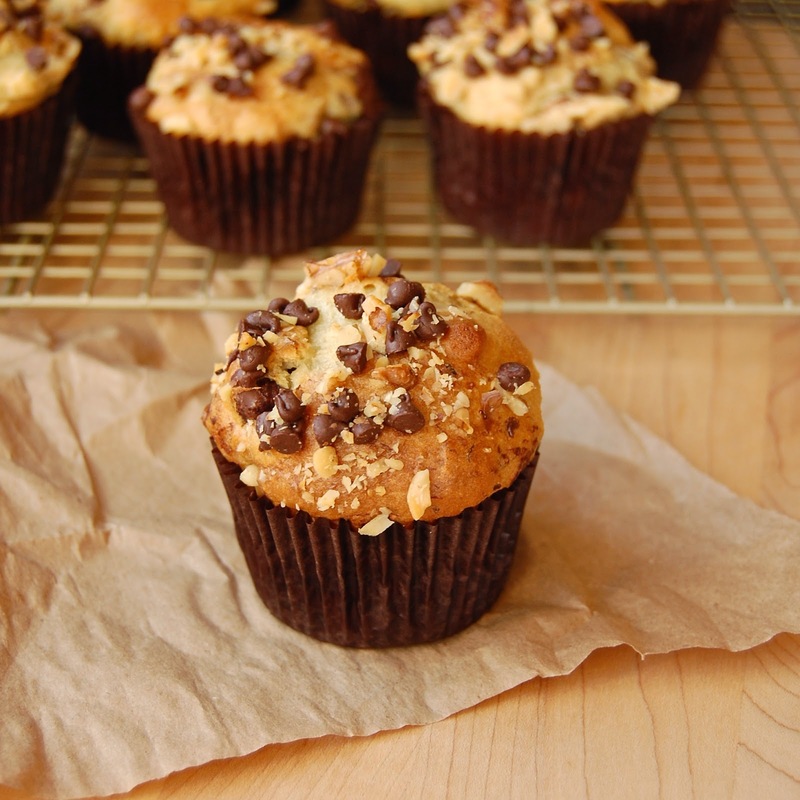 Transfer the muffins to a cooling rack to cool completely. Loved them! Also subbed I a bit of coconut flour-1/2 cup in a double batch (I was a little short of my gf mix), which added some nice flavour and richness. And added cinnamon and nutmeg, and brown sugar instead of white. Thank you! So happy that you liked them! I love the substitutions that you made. I'm going to have to try that next time!